I was just roaming around a few picture sites and came across a picture of a large crater on the farside of our moon, and it suddenly struck me how obvious it is that most 'impact' craters could not possibly be caused by an impact at all. Surely if the main crater or the one on it's rim closer to the viewer or the one on it's rim closer again could not be caused by an impact, for the thin wall where the rims meet would surely have been blown apart by an impact event. Of course, if impact did not create these craters, it begs the question of what did. That can be easily be answered in an Electric Universe, and I feel this type of misnomer should get a lot more publicity than it currently does. There are of course other features evident which cannot be explained by an impact scenario, such as the terraced walls of the main crater, and the peaks in the centre thereof. Is anyone else as frustrated as I am at the mainstream ignorance of such evidence? I would like others to post their finds of 'impact' crater pics which are clearly not from an impact on this thread, to gather everyone's observations of such in one place. Please include the site where the pics came from, if possible. If enough of this info can be collated in the one place it would be relatively easy to create an article from it, so post away and let's see what happens. Last edited by nick c on Tue Mar 29, 2011 9:05 am, edited 1 time in total. Well in this photo of Hyperion my personal favorite "impact crater" is the one on the left. Well... no the one on the right... no wait!! - the one in the middle?? Surely the 'impact' paradigm is discredited in the majority by the nature and sheer quantity of Hyperion's "craters". 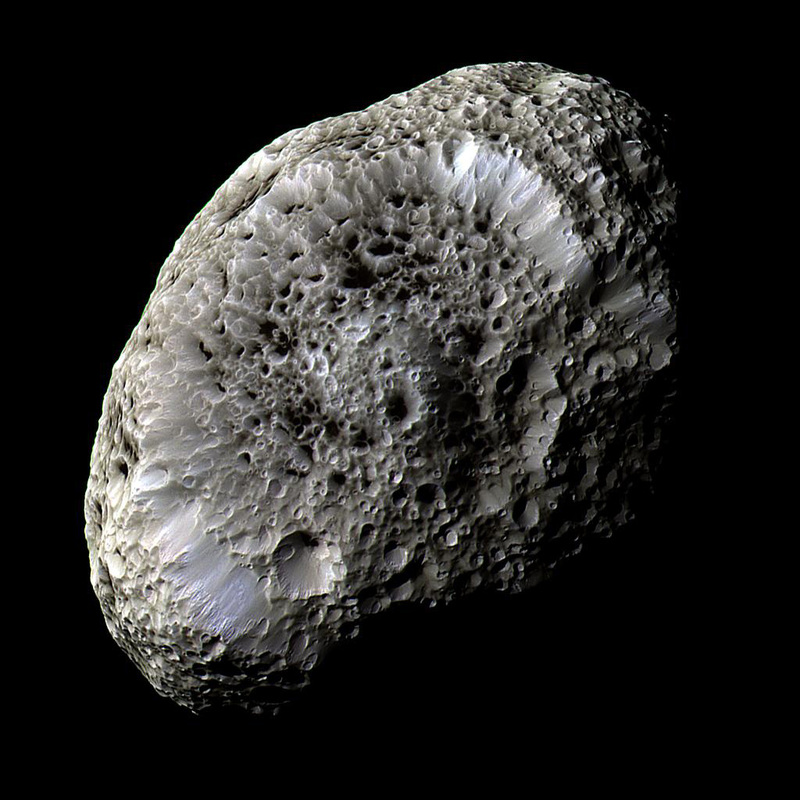 Seems to me that Hyperion simply should not exist were these "impact craters". Below is highlighted what I suspect to be its the largest "crater" remnant with domed center. 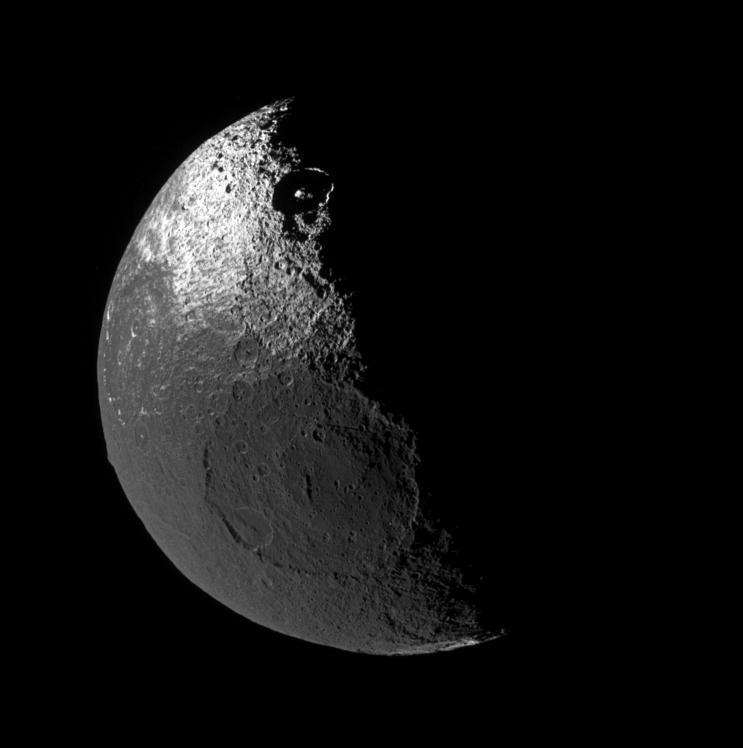 The remnant I theorize above bears the peculiar size relationship like that of Mimas and Lapetus. It usually fascinates me that there are such massive 'impact' zones in relation to a celestial body's size because it seems as if the scale should have obliterated its host . If I might point out a few other "obvious features:"
Note the crater chain to the left of the medium crater below the large one mid frame. Three of the 5 craters shown roving left appear to share a common scalloped wall. This seems odd. Notice also that the ROCK that has been "impacted" does not appear to be "cracked" or display and evidence of "breakage." Rather most of the features seem to be curiously rounded off or melted-looking. Which seems "odd" from an impact standpoint and from the standpoint of a moon with no atmosphere to "weather" its surface. Shouldn't the crater rims all be in "sharp relief" if they're basically unchanged from their origins? CJ Ransom has categorically shown that electrical arcs are capable of forming just such low-rimmed, flat-floored craters with a melted appearance. Likewise similar experiments by Dahlenaz (CRT experiments) and Plasmatic MnemoHistory (ionizer experiments) have replicated very similar crater results based on electrostatic and electrodynamic processes (I believe), respectively. If one takes note of the largest crater in the image: one sees that the central region has a peak. But, strangely, it's not a single cone, it's a series of local rounded knobs! Does an impact by a large projectile typically leave well-centered rounded knobs as impact debris These hardly seem like the standard model's "impact rebound cone" or what have you. These items seem in some cases quite discrete objects. More details become apparent, if slightly fuzzy. Terraced walls do seem to present a bit of a problem... Among other things. You know what else usually strikes me. In the larger photo you've linked, when zooming in, the scalability is apparent as there are so very many smaller to tiny examples of the same process. Giday all, seems plasma physics is not quite as new as we all might think. Specifically the comparison of craters on the moon with electrical effects in the lab was first made in 1775!! Yep, that's no typo, 1775. I recently came across a pdf from: http://www.osti.gov/energycitations/pur ... 9M/native/ titled 'Tracking Down the Origin of Arc Plasma Science'. June the 14th. I took the spot upon smooth pieces of lead and silver. It was, in both cases, like that on the brass knob, only the silver consisted of dots disposed with the utmost exactness, like radii from the center of the circle, each or which terminated a little short of the external circle. Examining the spots with a microscope, both the shining dots that formed the central spot, and those which formed the external circle, appeared evidently to consist of cavities, resembling those on the moon, as they appear through a telescope, the edges projecting shadows into them, when they were held in the sun. (Original caption) "Erosion craters (here caused by a cathodic arc discharge on copper), similar to “cavities, resembling those on the moon” This image was obtained using a scanning electron microscope; courtesy of Burkhard Jüttner, Berlin." It thus was over 230 years ago that someone may first have mused, "Impact schmimpact!" This image shows the striking Maunder crater lying at approximately 50° South and 2° East, in the Noachis Terra region on Mars. The High Resolution Stereo Camera (HRSC) on ESA’s Mars Express orbiter took pictures of the Noachis Terra region during orbits 2412 and 2467 on 29 November and 14 December 2005 respectively, with a ground resolution of approximately 15 metres per pixel. The sun illuminates the scene from the north-east (top left in the image). Maunder crater, named after the british astronomer Edward W. Maunder, is located halfway between Argyre Planitia and Hellas Planitia on the southern highlands of Mars. With a diameter of 90 kilometres and a depth of barely 900 metres, the crater is not one of the largest impact craters on Mars at present, but it used to be much deeper. It has since been filled partially with large amounts of material. This colour scene has been derived from the three HRSC-colour channels and the nadir channel. Does anyone realise how ridiculous that sounds? This 'impact' crater is 90,000 metres wide, and 'barely' 900 metres deep. That is a depth ONLY 1% OF ITS WIDTH!!! That's 55 MILES across and only 2,950 feet deep. So, did the 'ejecta' all go straight up, and fall straight back down into the crater? They try to (sort of) explain this away by saying one side of it caved in. ... It has since been filled partially with large amounts of material. Let me repeat, this crater only has a depth of 1% OF ITS WIDTH Shocked . And there are probably many more like it, visually it certainly appears so, but I just noticed the dimensions of this one, and my brain said "that's only 1% of its width... "
"Still comes out to 1% of its width..."
"Can't be, that's only a shaving..."
Forgive me if I sound like I don't believe in fairy tales, but how on Ea... Mars could it be so shallow? We really could do with a geologist in the house. Good review of the crater and the formations. The electrical nature of the formation seems obvious, doesn't it? Once electricity is in your mind, you see the examples everywhere you look. The last image is particularly interesting. 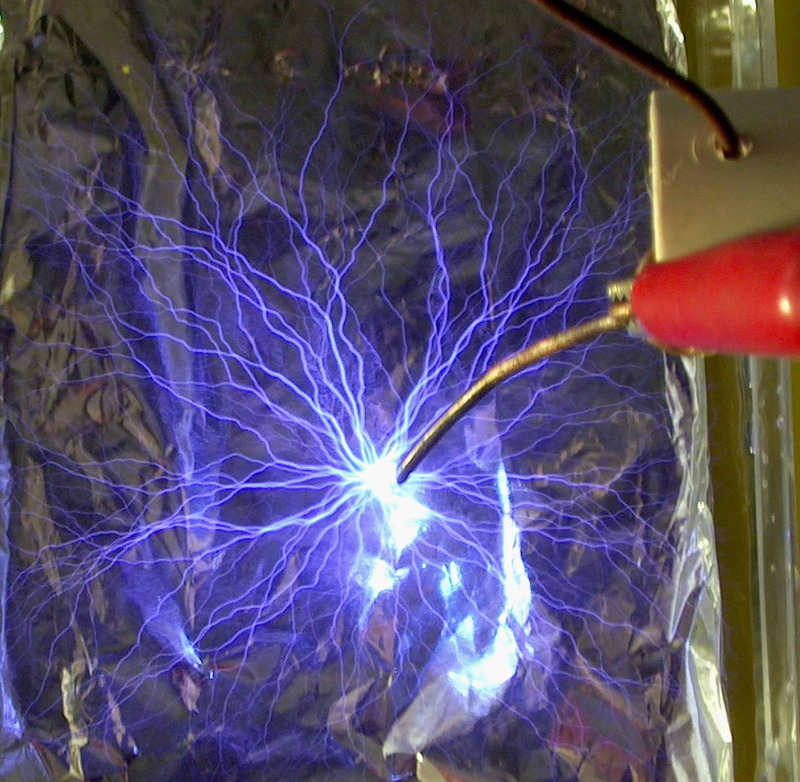 In the Mars in Miniature Picture of the Day, we briefly referred to one of our ideas that the silicon dioxide substrate that forms the 'floor' of Mars can be transmuted into iron through the action of the electric arcs. In the image, that process looks plausible. davesmith_au wrote: Giday all, seems plasma physics is not quite as new as we all might think. Specifically the comparison of craters on the moon with electrical effects in the lab was first made in 1775!! Yep, that's no typo, 1775. Ohh yeah, I read that a long while back (even bookmarked it 'cause it was that good!). Actually, there's a part 1 & part 2. But I think the part 1 is most interesting. If only for that image, and the fact that the person who discovered these arc melted spots IMMEDIATELY likened them to the craters on the moon. Common sense isn't as common as one thinks. But that guy had it right, in my opinion. davesmith_au wrote: Does anyone realise how ridiculous that sounds? This 'impact' crater is 90,000 metres wide, and 'barely' 900 metres deep. That is a depth ONLY 1% OF ITS WIDTH!!! As you said, it's 55 miles wide, and 2950 feet deep. So, what, did one side's materials collapse over 20-30 miles through the crater...?? C'mon. Who's taking bets that there's only a surface layer of sediment over a relatively unbroken surface with layering contiguous with that outside the crater (basically undisturbed layering) and no impact fracturing? Steve Smith wrote: In the Mars in Miniature Picture of the Day we mentioned that the dunes look solid rather than frangible. As a complete aside, what does frangible mean? And is it roughly synonymous with friable? I've seen both words, though not always in sufficient context to quite grasp the specific meaning. Looked them up on thefreedictionary.com and they seemed to have roughly the same definition. IE, easily broken, brittle, etc. Just for my own edification? As you were... Back to the discussion. Reminds me handily of the dunes in Proctor Crater / Russell Crater dunes, as well. As you say, a very repetitious pattern. I still wonder how it is that the dunes are so completely localized and not splayed out dusting a much wider area more finely. Rather the dunes seem to be completely clumped up in one spot without intruding into the neighboring terrain, as pointed out in the Proctor Crater thread. This thread reminds me how absolutly INCREDIBLE you electric universe people are. I simply can not comprehend how NASA and astronomy in general can ignore you people. Will we EVER emerge from the scientific DARK ages? Or will the evil empire rule forever? A great image. Rather fond of it myself! davesmith_au wrote: How's this from physorg.com. Look carefully at Hyperion and you'll notice that it is a spiral, rather than concentric circles. In Birkeland current movement, the Bennett Pinch effect gradually spins tighter and tighter. Of course, this happens in time dependent scale -- a larger arc may require a few seconds, rather than thousandths of seconds. Since the pinch is impacting the surface at that time, it forms a spiral that grows smaller according to a specific formula. You see that it begins on the outer edge as a crater and then forms a hump at the end. This helps to explain the possible formation of Shiprock, Brandberg and the Big Three. 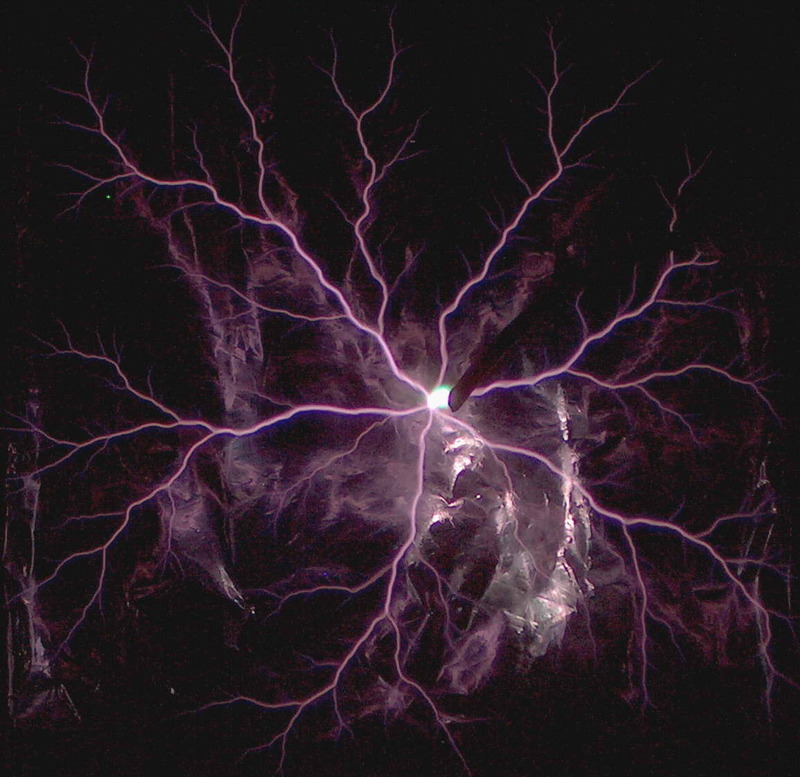 The terrain surrounding all of those features is sculpted by what can only be high energy plasma discharge -- conventional theory is certainly inadequate and the laboratory experiments bear out conclusions of the Electric Universe theory.